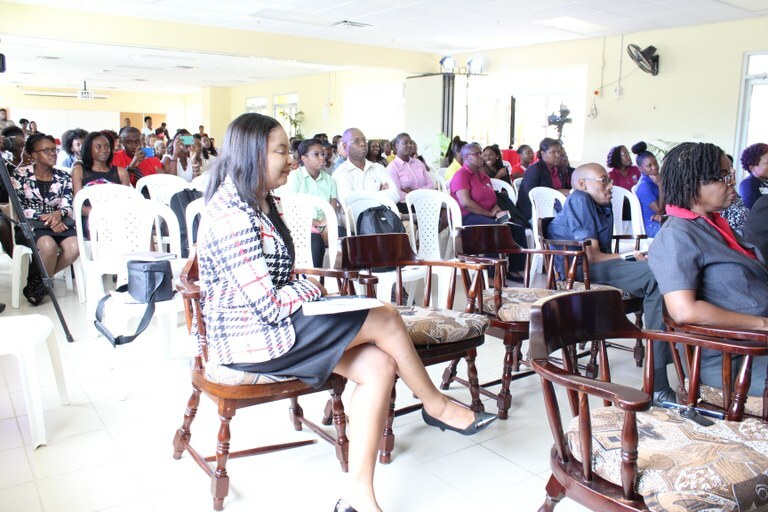 UTech, Jamaica Media Students Mount 4th Annual Exhibition — UTech, Ja. 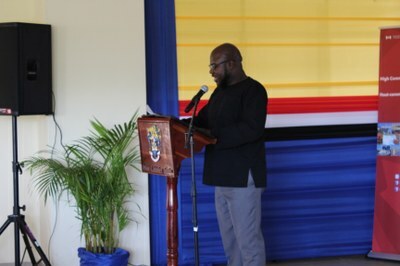 Dr. Rohan Lewis, Dean, Faculty of Education and Liberal Studies delivers the welcome at the opening ceremony of the 4th annual Communication Arts and Technology(BACAT) Final Year Student Exhibition held on Thursday, May 3, 2018 at the Shared Facilities Building, UTech, Jamaica Papine Campus. 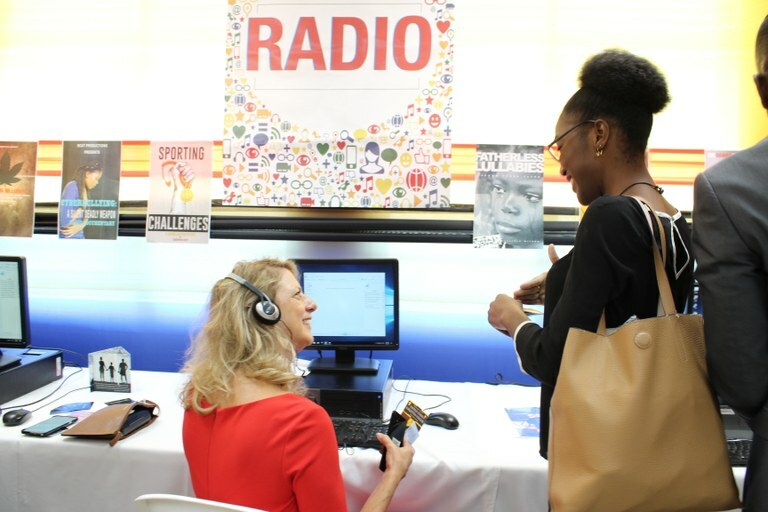 The impressive showcase of students’ final media project includes publications, radio and television documentaries, digital animation, website designs and media campaigns. In his welcome at the Opening Ceremony Dr. Rohan Lewis, Dean, FELS noted the significance of the exhibition being opened on World Press Freedom Day and pointed to Jamaica’s recent rise by two spaces to 6th on the 2018 World Press Freedom Index. Jamaica ranks higher than the United States of America which ranks 45 and Canada which ranks 18 on the Index. It is the highest ranking for a Caribbean country since 2002 when the Index was introduced. Keynote speaker was Her Excellency Laurie Peters, Canadian High Commissioner to Jamaica. In her wide ranging remarks she shared on her personal career experiences in media. The High Commissioner encouraged the large student gathering of budding media practitioners with advice she referenced as “Laurieisms.” She urged students to speak to what they know, have something to write about, explore rather than just explain, know their audience and be good to the “little” people and to speak from the heart. The opening ceremony included an impressive show reel montage of the students’ media projects. 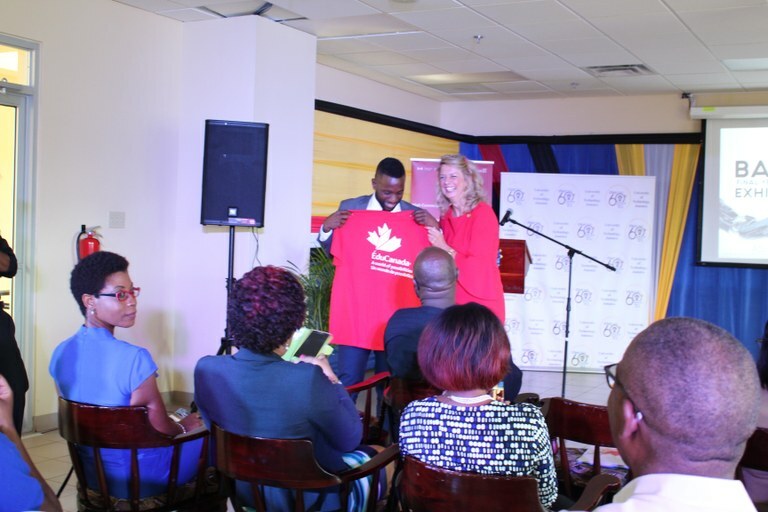 Broadcast Journalist Archibald Gordon who was Master of Ceremonies is happy to receive a Canada branded t-shirt from High Commissioner Her Excellency Laurie Peters for asking the first question in the Question and Answer segment following her presentation. 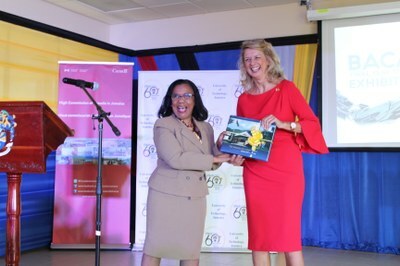 A thrilled High Commissioner, Her Excellency Laurie Peters is gifted with the book, “The Making of a University: From CAST to UTech” written by Dr. the Hon. Alfred Sangster, OJ being presented by Mrs. Mercedes Deane, University Registrar in appreciation following the High Commissioner’s address. 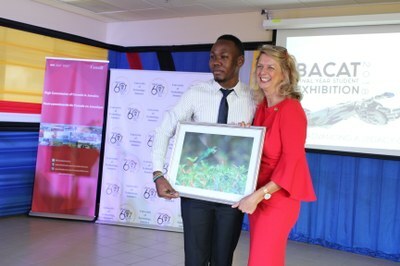 Below, the High Commissioner happily accepts a photograph featuring the Jamaican Hummingbird done by BACAT final year student Shorn Hector presented by Chevauni Blair, BACAT final year student. High Commissioner Peters looks keenly at a media campaign project on “Cyberbulling” by final year BACAT student Jhenelle Lewis. Looking on is final year student, Joneal Crawford. 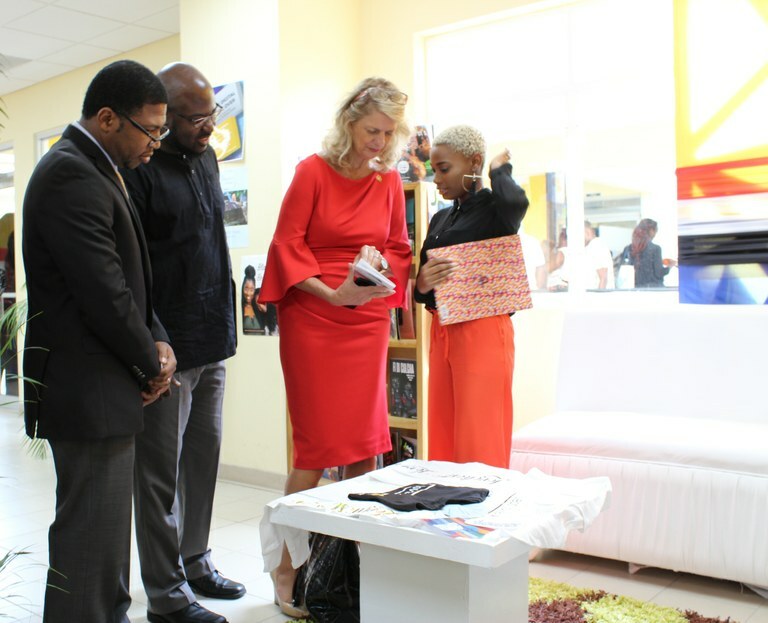 High Commissioner, Her Excellency Laurie Peters interacts with BACAT 3rd year student Miseanie Falconer about her publication on display at the exhibition. Looking on from left, are Dr. Gareth Phillips, Vice Dean, FELS and Dr. Rohan Lewis, Dean, FELS. Her Excellency Laurie Peters interacts with final year BACAT student Sheldonny Rodney as she listens to the radio documentary on “Untold Stories: Forgotten Folklore” which she produced for her final media project. A panel discussion focusing on press freedom was also held on Thursday, May 4, 2018. 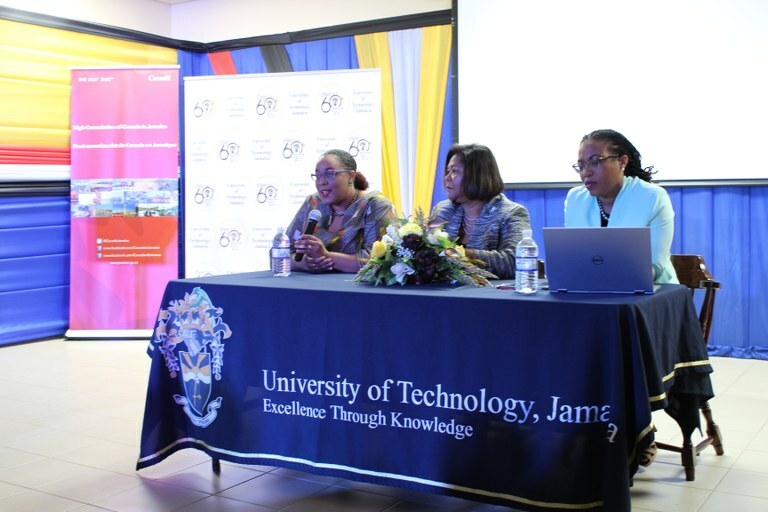 The panellists were Ms. Naomi Francis, Press Secretary, Office of the Prime Minister, Dr. Marcia Forbes, Executive Chairperson, Phase Three Productions Limited and Dr. Deborah Hickling Gordon, Visiting Fellow, Creative Economy, Development, UWI. The exhibition is located at the Shared Facilities Building in rooms 47C3 and 47C4, and will be open for viewing from 10:00 am to 5:00pm today Friday, May 4. A selection from the exhibition will also be mounted at the Western Campus today. Dr. Deborah Hickling Gordon (left) makes a point during the panel discussion centred on press freedom. Listening are Dr. Marcia Forbes (centre) and Ms. Naomi Francis.